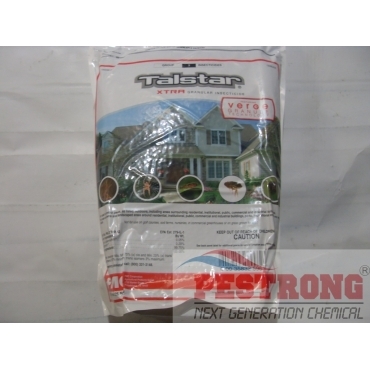 Where to Buy Talstar XTRA Granules, Talstar XTRA Granules - 25 Lb Verge Bifenthrin Insecticide - $43.95 for Sale with Fast Free Shipping! 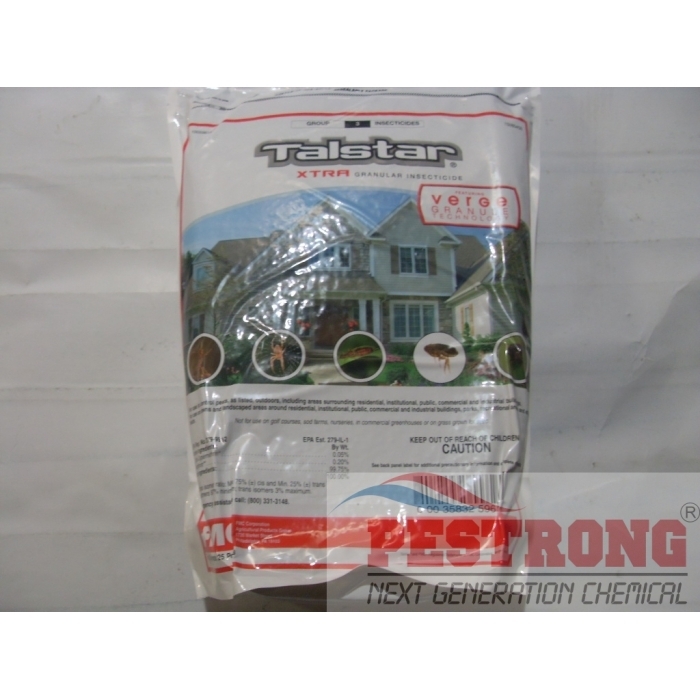 Talstar XTRA Granules - 25 Lb Verge Bifenthrin Insecticide is an effective and versatile tool for a wide range of accounts with long lasting up to 4 months. Eliminate Fire Ants and Other Outdoor Pests in Record Time Lawn pests don’t just crash picnics. Some, like imported fire ants, can pose a serious health risk for humans and pets. As a pest management or turf professional, homeowners count on you, to quickly eliminate these invaders and keep them from coming back. That’s why FMC Professional Solutions has created new Talstar XTRA granular insecticide, a proprietary, patent-pending solution for outdoor pest control that’s faster than you ever thought possible. In addition to delivering the long-lasting residual protection professionals have come to expect from Talstar — the number-one trusted brand of insecticides — new Talstar XTRA granular insecticide is proven to eliminate dangerous fire ant colonies in four hours or less. Which means you can help your customer return to their yards with complete peace of mind, sooner than you ever thought possible. XTRA Protection The broad spectrum control of new Talstar XTRA granular insecticide is labeled for use against most ants (including fire ants) as well as chinch bugs, fleas, ticks, mole crickets, crane flies and many other lawn pests. For XTRA Speed As the leader in the granular insecticide business, FMC Professional Solutions devotes significant resources to developing technologies that solve the specific and evolving challenges pest professionals face. As part of this commitment to Customer Driven Innovation, FMC has been researching new and better ways to control dangerous fire ants and other nuisance pests. With the addition of zeta-cypermethrin, a totally new active ingredient designed for accelerated knockdown and kill, Talstar XTRA granular insecticide delivers effective control at record-breaking speeds. Research trials and field tests conducted by industry professionals have proven that with the addition of its powerful new active ingredient, Talstar XTRA granular insecticide eliminates fire ant colonies within four hours or less. And in some cases, the fire ant populations were decimated in minutes, not hours. At these speeds, other products can’t even come close to the control of Talstar XTRA granular insecticide. A Groundbreaking Granule With its unique sand core granular structure, Talstar XTRA granular insecticide has been engineered to offer both you and your customers the ultimate application benefits. Heavy sand carrier prevents granules from drifting off target Small granule size allows for better product penetration into mulch Virtually dust-free Low odor Speed and Residual When It Counts When it comes to fire ants and other lawn invaders, your customers are counting on you for fast, effective and long-lasting action. Now with Talstar XTRA granular insecticide, you can help restore their peace-of-mind sooner than ever, and help keep them feeling secure by using the most trusted brand in general pest control. All the Residual You Trust In addition to its breakthrough active ingredient, Talstar XTRA granular insecticide has been formulated with the same long-lasting residual of Talstar PL granular insecticide, for the highly dependable control professionals have come to expect. While fire ants and other pests can be gone in as little as minutes, the residual protection of Talstar XTRA granular insecticide is proven to remain effective for at least four months. Application Flexibility Talstar XTRA is approved for use on a wide variety of application sites, including residential lawns, institutional grounds, around buildings (public, commercial and industrial), parks, recreational areas and athletic fields. This comprehensive label makes Talstar XTRA an effective and versatile tool for a wide range of accounts. Excellent! Got rid of ant mounds quickly and completely. With other products the ants just seem to move to another area of the yard. Not with Talstar! product arrived very fast. my ant problems are now over as well. Can't go wrong with this product. Controls ants just as effectively as the much more expensive option. Who needs a 52 week residual anyway?? Maybe in Florida since ants typically never go "dormant" due to a lack of hard freezes. Talstar will knock down existing mounds quickly but I would use orthene for individual mound treatments because it is a cheaper option. However, if you are looking for a 3 month residual then Talstar is a great choice.